We had a pretty quiet weekend around here. I nursed sick people back to health mostly but also enjoyed Ozzie’s first pre-season baseball game, tried to keep things quiet but still fun around the house for the healthy family members and neighbor friends, half-watched lots of football, unintentionally skipped church and gave the girls’ hair bow game a huge upgrade. Also, the sun came out to play all weekend which was amazing and rare this time of year. Just what I needed. 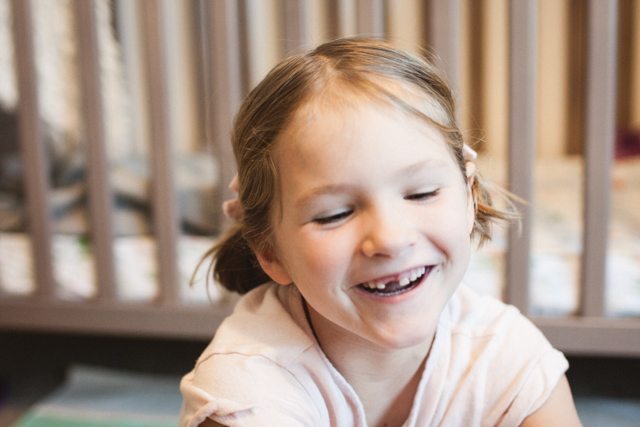 I’m always rushing around the house in the morning (or anytime of day actually) trying to find something cute to put in the girls’ typically haphazard styled hair. It’s usually brushed or styled but rarely both and an accessory seems to clear up any confusion. Anyways, I often come up empty handed so during a rare calm moment I decided I should do something about it and either order a bunch on etsy or make my own. Decide between DIY and etsy is always tricky, but this time with a pile of unused fabric giving me the stink eye from my office I decided to go the handmade route. 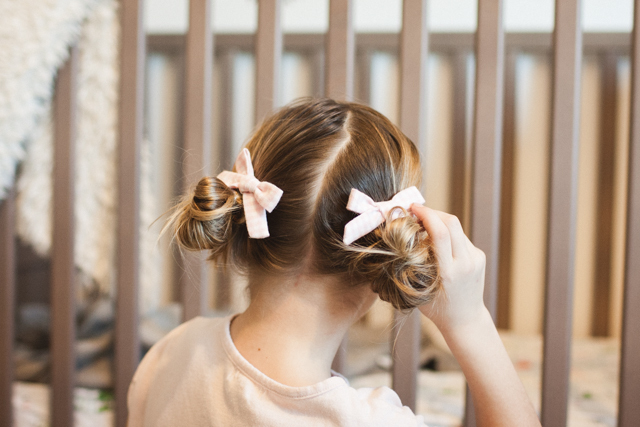 Because it took a little while to perfect a pattern I thought I would share the template and how-to below for those of you who could use some extra hair bows in your life! Print out pattern on card stock and cutout. Pick your fabric(s). Poppy’s hot coral confetti dot bow is made from this fabric in my Spoonflower shop. The others were ones I had stashed in my office. For the tail of the bow, fold your fabric down a couple inches, line the top edge of the pattern with the fold, trace and cutout. Trace and cutout the other pattern pieces. Fold the long sides of the small middle piece to the middle so they overlap and iron in place. Fold the tail piece in half, pattern side together and iron. Sew along the raw edges of the tail, leaving 1″ open in the middle. Turn right side out. Now grab your bow piece! Fold in half the long way, pattern side together and sew. Leave short ends open. Turn right side out and fold so the seem is in the middle. Iron in place. Fold bow in half and sew shirt ends together. Again, fold bow so the seem is in the middle and iron in place. Tie a piece of twine around the middle of the bow, pull tight and tie in place. Trim excess string. With the long points of the tail in the middle, pinch together with the bow. Wrap middle piece around once (add your head or hairband in if using), overlapping and glue in place. Add alligator clip and glue in place as desired. 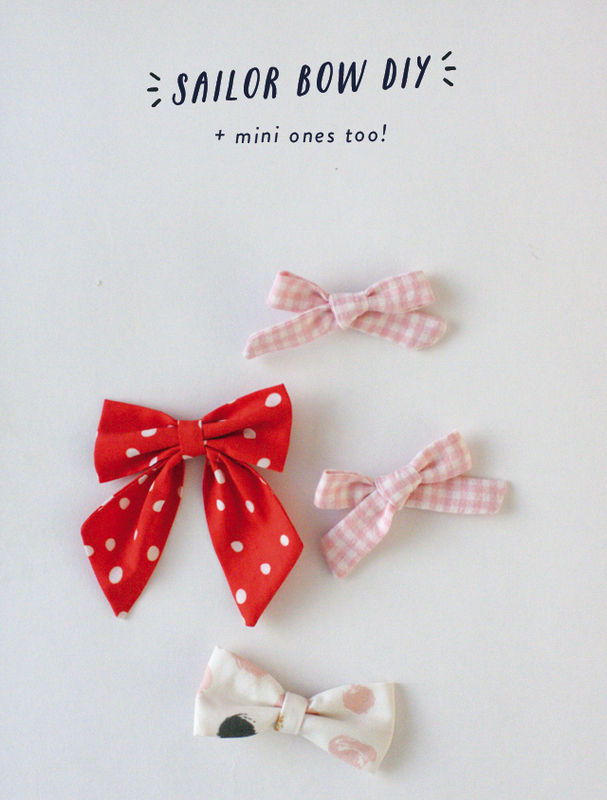 To make a mini-bow, follow steps 1-5…. tape the pattern together (should be about 12″)…. then tie into a bow. Add hair accessory and secure as needed with glue. Poppy has started saying “Owww” in the sweetest voice every time I touch her hair lately but also started leaving accessories (mostly) in her hair. Car rides being the main exception. 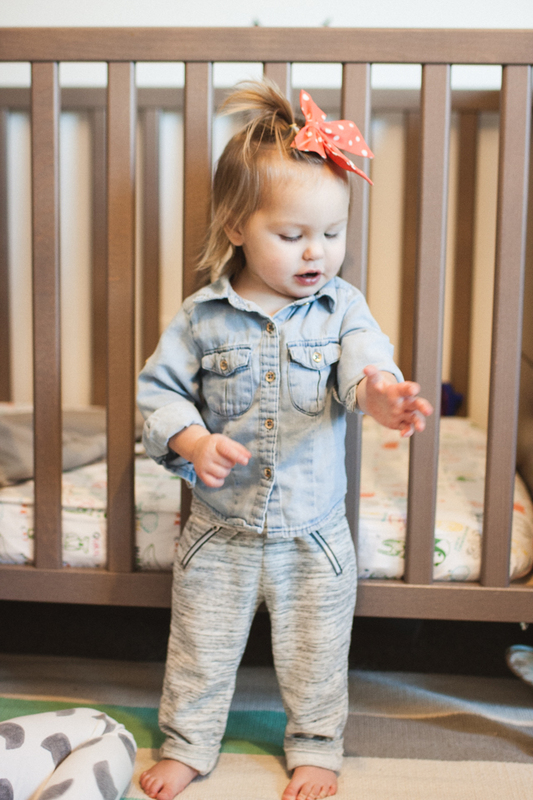 Aren’t the mini bows cute in piggies?! A good reason to make them in pairs. 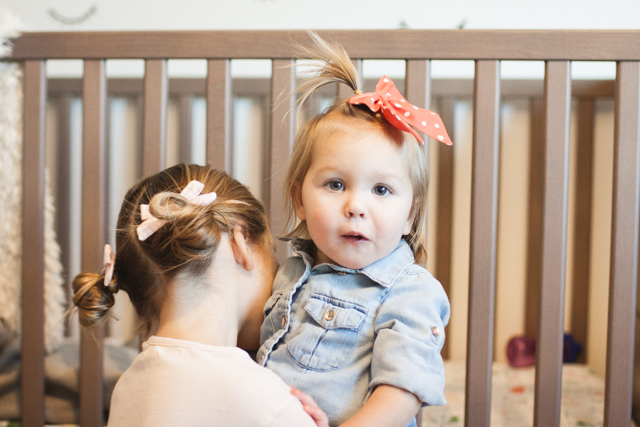 … and this skeptical look on Poppy’s face. 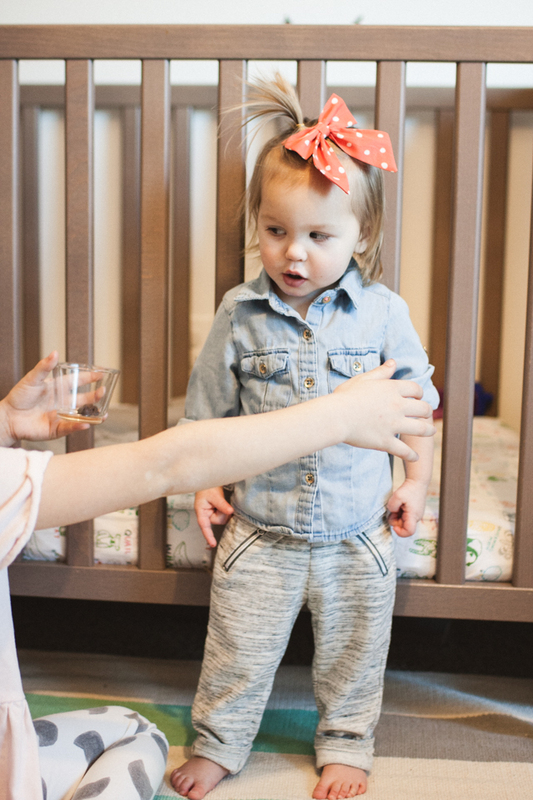 She’s learning real quick how this sibling thing works. Smart cookie. Still have a small pile of fabric waiting to become bows and I’m thinking I’ll save a few to give as gifts. Let me know if you have any questions or requests for other DIY projects! 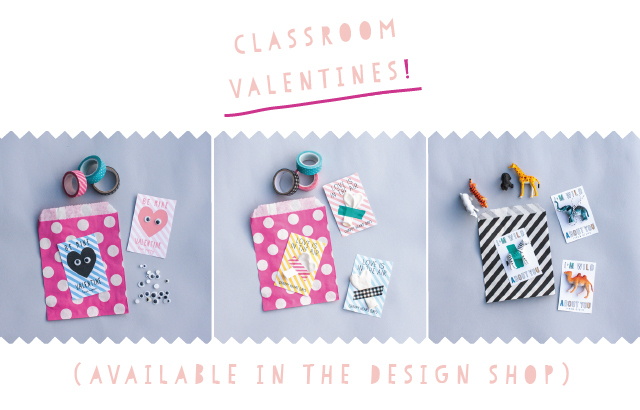 PS – Have you checked out our Valentine designs yet!? So far the “wild about you” valentines and black striped bags are flying off the virtual shelves. Thanks to everyone who has purchased already! Love your blog! Love your design style, your adorable family, and your freebie graphics!!!!! Keep up the awesome work. I see so many of these cute bows all over etsy. I am trying to make some myself and found your blog. When I try to glue the bows to alligator clips, they seem to be able to peel off pretty easily. Any suggestions? I wish I could see a photo of how shops like freebabes attaches their school girl bows to clips! I really want to try the mini bow! Is there a reason why you tape the mini bow instead of just making the one piece 12 inches long and then tying a bow? Hi! I have a small shop on Etsy and wanted to add sailor bows, do you mind if I use this pattern? what fabric do you find best for bow making form spoonflower?